The candidates will be given sixty multiple choice questions. The time given to complete the exam is ninety minutes. The passing score is fixed as 68%. If the candidates score less than the mentioned percentage, then they need to reappear for the exam. The registration fee for the exam is USD 200. The retake fee for the exam is USD 100. The candidates should not refer any online materials or hardcopy while appearing for the exam. There is no specific prerequisite to appear on the exam. They are recommended to take Visualforce (Dev401) and Building Applications with Force.com. 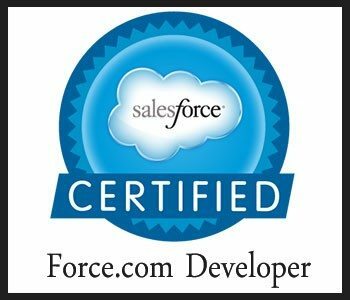 The below sample questions will help the candidates to get an idea and model of the salesforce.com certified developer exam. Salesforce Training Institute in Chennai have designed to make you familiar with frequently asked questions in the exam. Remember, the original question paper will have questions less difficult or more difficult than the below model. 2. Universal Containers tracks Candidates as a custom object in a recruiting application. On a candidate record, the city entered in the City field must be in the state selected in the State field. A. Encrypted fields are not available in filters for list views, reports and Roll-up Summary fields. B. Encrypted fields can be included in Search results. C. Encrypted fields are not available for validation rules or Apex scripts. D. Encrypted fields can be included in report results. A. The Data Loader can bypass sharing model settings. B. The Data Loader can de-duplicate records. C. The Data Loader can be executed from the Command Line. D. The Data Loader can load more than 50,000 records at a time.